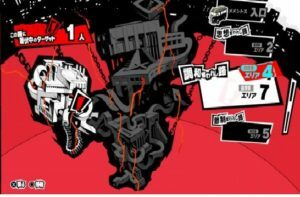 Information about how to gain experience in Persona 5 by using the Reaper that appears in Mementos. In Mementos, a strong enemy shadow occasionally appears known as the Reaper. It is a strong shadow that cannot be beaten unless you are at a fairly high level. It is advised to avoid the Reaper when it appears as it is very strong. However, if you can knock it out, you can get the Divine Pillar accessory that halves damage and a huge amount of experience. It is highly recommended to fight the Reaper during an Influenza warning. When encountering shadows during influenza warnings, including the Reaper, they have a chance of entering the battle under the effects of Despair. This will cause the shadow to succumb to despair and die after three turns. Go to Mementos on a day of “Influenza Warning ” . Move to a waiting room and save progress. After saving, move to an area and stand still until the Reaper appears. When the reaper emerges, the battle will start. Continue to fight if the reaper is under Despair. If it is normal, escape the fight and challenge them again. If the enemy collapses due to the effect of despair, move to the waiting room and save. After saving, move to the area and wait until it appears again. When under the effects of despair, the Reaper will self destruct after a few turns. Because you can get a large amount of experience when winning, this can be a valuable method when grinding levels. Special Skills are not necessary to earn experience. Take note of influenza warnings, as it only occurs at certain periods of time. These times are the only periods of time when influenza warnings occur. Since it is a very short period, those wanting to try need to pay careful attention to the time. Even during the influenza period, the Reaper’s Despair is random. The method may have to be repeated if the Reaper starts the fight without Despair. Really?! Wow, that is cool! Tried this for the first time just now. First time I found him, almost got wiped out. Second time… SCORE! XD I am not ready to face him normally by any means, but doing this was no big deal at all. Just save in the waitroom and keep trying if you fail to survive an encounter without. I tried this method on influenza day but the odds of a reaper with despair status is very low. I enagged and escaped more then 15 times without it happening. It’s possible they patched the US version.